The Lavender Graduation Ceremony will be held on Sunday, June 9, from 4:00–6:00 p.m. in the EMU Redwood Auditorium. Undergraduate and graduate students welcome! Graduates must RSVP by May 27. All other guests must RSVP by June 3 at 8:00 a.m. The LGBT Education and Support Services team works to affirm the lives of lesbian, gay, bisexual, transgender, queer, questioning, asexual, aromantic, and allied (LGBTQIA+) students, faculty, and staff by providing educational and supportive resources. 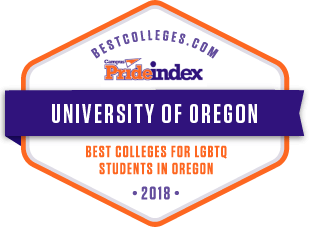 Our campus has been recognized as the top college in Oregon for LGBTQ students by the Campus Pride Index. We are dedicated to providing space for all University of Oregon community members to explore their understanding of sexual/romantic orientation, gender, gender expression, and intersections of identities. We look forward to being in community with you. LGBTESS offers programs that are designed to educate people about the truth and diversity of the lives of LGBTQIA+ individuals. Through ally training and panel discussions, we provide opportunities to share stories and ask questions in a way that fosters understanding, appreciation, and respect. Presentations are also available upon request. Our student-driven outreach teams engage and empower LGBTQIA+ current and prospective students. Whether organizing events, being involved in campus organizations, or taking part in educational panels, our student employees and volunteers connect with the greater campus community, sharing resources to support students’ well-being and academic success. In addition to our programs and services, there are organizations on and off campus, all focused on promoting awareness, education, support, and appreciation for lesbian, gay, bisexual, transgender, intersex, and queer issues. There's a reason we've been recognized nationally as one of the best colleges for LGBTQIA+ students. From gender equity housing options to inclusive medical and mental health care, the UO is dedicated to creating an environment of respect and encouragement for all of our students. Support is available through scholarships that are based on both merit and need. Students are also invited to apply for LGBTESS-sponsored trips to conferences. For students who are currently in or hoping to begin the process of transitioning while attending the UO, the university offers a variety of resources and services. Looking for a place to sip some tea, make some friends, and have fun? Come to LGBTea Time! From 12pm-2pm, there will be an assortment of free Townshend's tea and crafting with assistance from the UO Craft Center! Stop by the LGBTQA3 Office (EMU 022) for a great opportunity to interact with fellow members of the queer community. Taking the test is the only way to truly know your status! Eugene's HIV Alliance is coming to University of Oregon to provide accessible HIV testing for the campus community. Stop by the LGBTQA3 Office (Room 022 in the EMU) for the opportunity for free HIV testing! Please contact the coordinator for updated hours. Sign up for our email list. We'll keep you informed about programs and opportunities provided through our office, plus other related LGBTQIA+ events on campus and in the community.